Gold vs Satyameva Jayate Screen Count Prediction One Week Before the Big Release. Gold and Satyameva Jayate are the big Independence Day release happening in a week time from here on. Buzz regarding both the films are good and exhibitors are excited about the big clash. Exhibitors are expecting a cumulative business in excess of 25-30 crore nett on 15th August, 2018 (Independence Day). Great part is that both films can emerge as highest grossing films of Akshay Kumar and John Abraham career who are the lead actors of respective films. As there is still one week left for the release to happen. We give you the inside report of exhibitors and how they are planning to give screens to each films. Final count may change depending on ticket demands and buzz factor and actuals will be known by 14th August night or 15th August morning only. 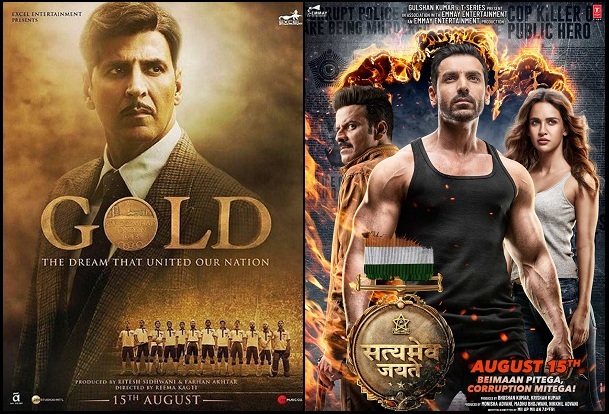 As if now, Gold is leading the screen fight from Satyameva Jayate. Gold is set to get a screening of 2800-3200 screens for 15th August, 2018. This is just perfect for such genre films. Considering clash it is actually great and excellent news for the makers. Coming to Satyameva Jayate, film is set to get screens of around 1600-2000 screens on 15th August, 2018. This is also good for a John Abraham starrer film. If film manages good occupancy in that much screens, then SMJ also can rock big time at box office. Lekin dusre log hamesha Akshay kumar se clash krte h kyo ? Salman , Amir , Srk ke sath kyo nhi ? Akshay Sir U are very good we are always with u .
Akshay is doing lot of good films and most of them are biographies. This again should be an inspiring story. I will go for GOLD. Satyamev jayadev may be having a good trailor but the acting skills of john serms to be limited though i still like him.